Luxembourger Andy Schleck fears Italian Ivan Basso the most for the Tour de France this July. 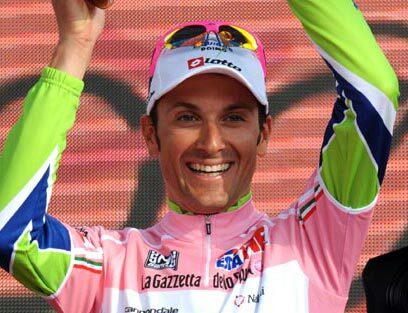 Basso of team Liquigas-Cannondale won the Giro d’Italia last year. This year, instead of racing for a third Giro d’Italia title, he decided to focus solely on the Tour de France. He finished second and third at the Tour de France prior to serving a doping suspension in 2007. Schleck’s former top rival, Spaniard Alberto Contador will likely serve a doping suspension that will force him to miss this year’s race. Contador won the Tour de France the last two years ahead of Schleck, last year by 39 seconds. Due to a doping positive for Clenbuterol at last year’s race, Schleck may be awarded the 2010 title. “On the road, Contador was stronger than me, the strongest of all. If you can show clearly that he has not respected the rules, I can consider myself the winner. Otherwise, I remain second,” added Schleck. The Spanish Cycling Federation (RFEC) indicated on Wednesday afternoon that Contador will serve a one-year ban and lose his title. However, with the appeals process, a final ruling could take some time. Schleck will lead new team Leopard-Trek at the Tour de France with his brother Fränk Schleck. Ahead of the Tour, his goals are the Ardennes Classics, the one-day races Amstel Gold, Flèche Wallonne and Liège-Bastogne-Liège. To prepare for the races and to face Basso at the Tour, Schleck has been training in the gym this off-season. The Tour de France will be Schleck’s first three-week race of the season. Basso raced both the Giro d’Italia and Tour de France last year. Though he won the Giro, he suffered at the French Grand Tour. Schleck last raced the Giro d’Italia in 2007, when he finished second and won the young riders competition.